When my post about Dishoom Chowpatty Beach went up a few weeks ago, one of my best friends called me straight away and booked me for a dinner date. She was as excited as I was about the idea of Chowpatty Beach coming to London. So on Tuesday we met at Waterloo and headed down, or rather up there. As Julius Caesar put it, we came…we saw..we conquered, except we decided to snack before we left. Again I was disappointed to see that the menu was rather limited. There was no Mumbai style chilli cheese toast and although the stuffed naan and kati roll options sounded tempting, sadly for me I was vegetarian for the day. Having quickly decided that dinner would have to be elsewhere, we ordered a portion of veg samosas (despite my cousin’s voice telling me otherwise..see previous post) and some hot chai. 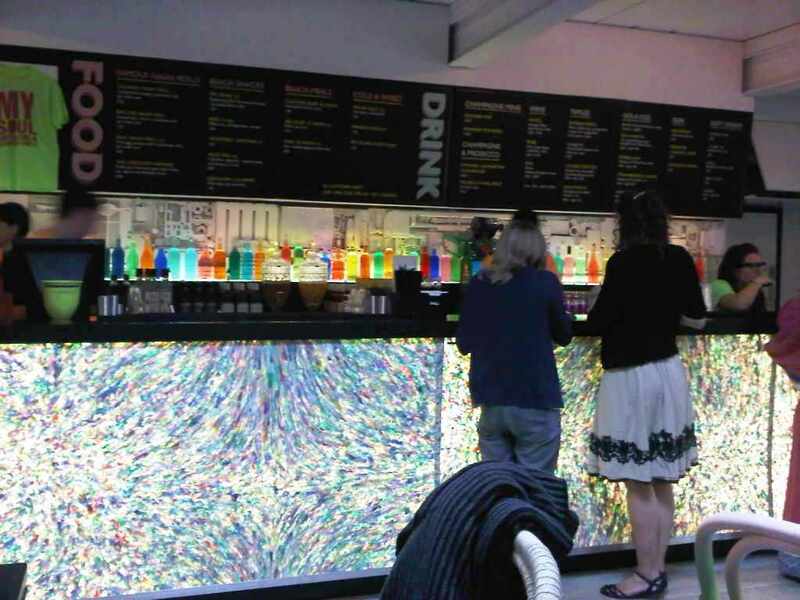 We were advised by our friendly waiter that the tea would take 40 minutes to make. Whilst it took us 5 minutes to get over the shock that tea could take that long to brew we paid for our items and took a seat. 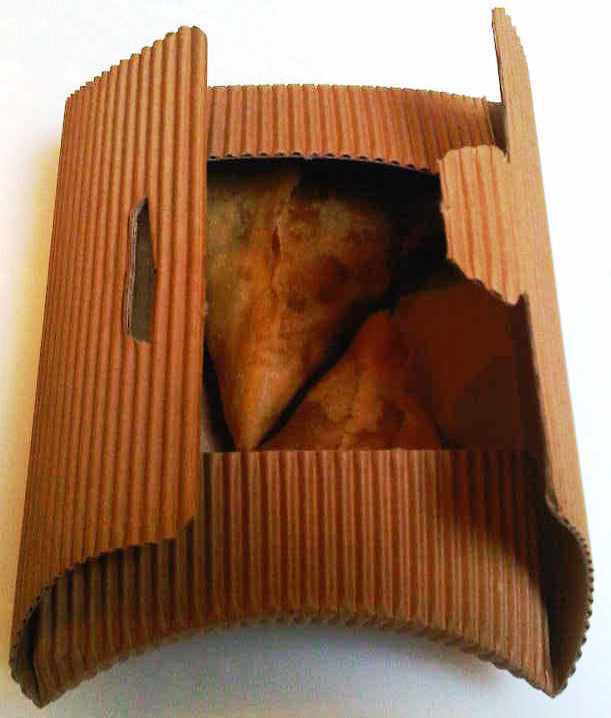 Our Samosa’s were pretty quick to arrive and came in pretty funky packaging. I have to give them 10 out of 10 for quirkiness, although not traditional in the slightest. The samosa’s were slightly spicy but tasted totally authentic. Our tea finally arrived after a 30 minute wait (far too long in our books) but I must say, the wait was most definitely worth it as the tea tasted totally authentic, although would have been nicer served in traditional glasses. Oh well..I guess beggar’s can’t be choosers. Although my bubble was well and truly burst by this mediocre attempt of Chowpatty Beach, I’m hoping the brains behind Dishoom have some plans to actually making use of the 48 tonnes of sand they painstakingly placed on the London’s Southbank once the sun sets in and that maybe I was too quick in my steps to check the place out having visited in only its second week of opening. 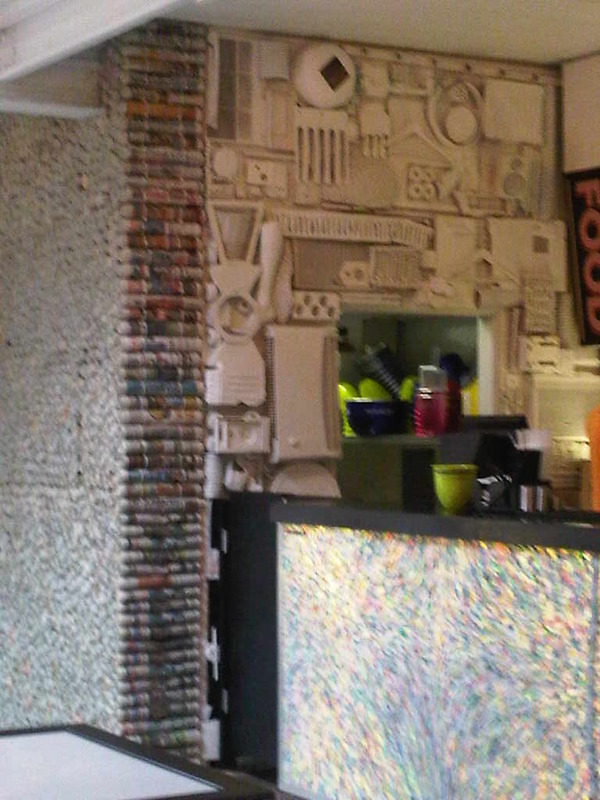 Whilst waiting for my tea to arrive, I was however intrigued by the moving moustaches on the picture along the back wall. 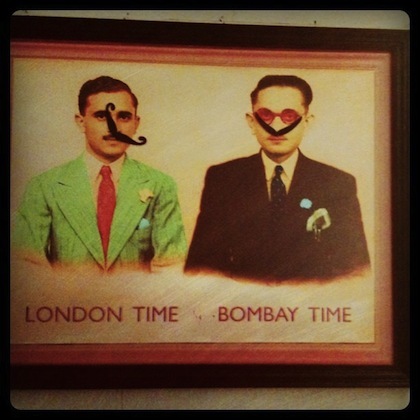 I was quick to notice that every time I looked up, the moustaches had in fact changed position, that was until my friend pointed out that the picture was actually two clocks, one with London time and the other with Mumbai time. My blonde streaks came back to haunt me when I noticed that under the two men, it did in fact state ‘Time in London’ and ‘Time in Mumbai’..oh well..once a blonde..always a blonde!! Although I wasn’t overly impressed, I might have to give Dishoom Chowpatty Beach another try later in the summer, purely because of my appreciation of good tea and my loyalty to all things Mumbai! Stay tuned for more! Love the new look Digressive!